NASA Television will broadcast the Monday, Nov. 25, launch and the Friday, Nov. 29, docking of an unpiloted Russian resupply spacecraft, loaded with almost three tons of food, fuel and supplies for the six Expedition 38 crew members aboard the International Space Station. The Progress 53 cargo ship is scheduled to launch from the Baikonur Cosmodrome in Kazakhstan at 3:53 p.m. EST Monday (2:53 a.m. Baikonur time Nov. 26). Live coverage of the launch on NASA TV will begin at 3:30 p.m. The Progress vehicle will pass within a mile of the station Nov. 27 to test an upgraded automated rendezvous system, then return for docking Nov. 29. Video of the flyby will be recorded and replayed as part of docking coverage. The Progress 53 craft is scheduled to complete its automated docking to the aft port of the space station's Zvezda service module at 5:28 p.m. EST Nov. 29. NASA TV coverage will begin at 4:45 p.m.
At Baikonur continues preparations for the launch of a space rocket ( RKN ) " Soyuz-U " to transport cargo vehicle (THC) "Progress M -21M " . November 23 in accordance with the schedule of prelaunch specialists of the space industry Russia performed the operation for removal of RKN to the launch pad . Space rocket installed on the launch pad . 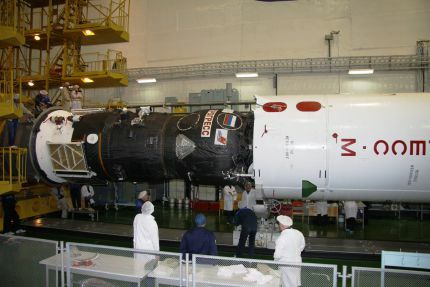 Operations carried out on schedule the first launch day . 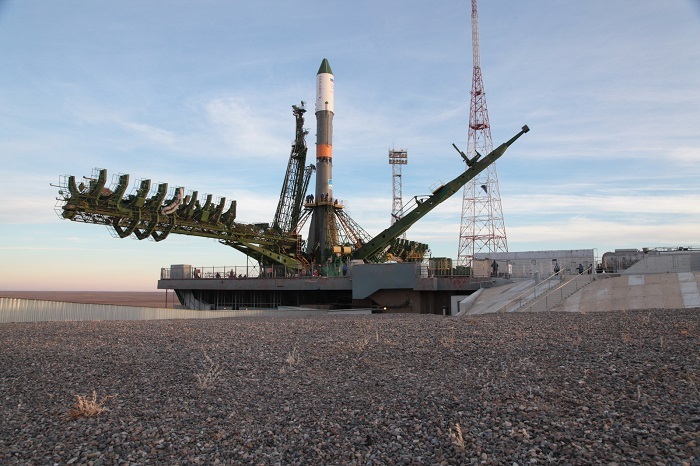 A new Russian resupply craft will launch Monday from the Baikonur Cosmodrome, Kazakhstan, delivering food, fuel and supplies to replenish the station crew. The Progress 53 cargo craft will take a longer route to the station so mission controllers can test a new automated rendezvous system. Fueling with liquid oxygen and rocket-grade kerosene (known as “RP-1″) concluded shortly before today’s liftoff and transitioned into a topping-off mode, whereby all cryogenic boil-off was rapidly replenished. This ensured that the liquid oxygen tanks were maintained at Flight Ready levels, ahead of the ignition of the single first-stage engine and the engines of the four tapering strap-on boosters. Internal avionics were initiated and on-board flight recorders were spooled-up to monitor the vehicle’s myriad systems. At T-10 seconds, the turbopumps on the core and strap-on boosters came to life and the engines were confirmed to be running at full power, producing a retraction of the fueling tower and a perfect, on-time launch into the darkened Baikonur sky. Fifteen seconds after liftoff, as noted by AmericaSpace’s Launch Tracker, a pitch and roll maneuver was completed, placing the vehicle onto the correct trajectory to insert Progress M-21M into orbit. 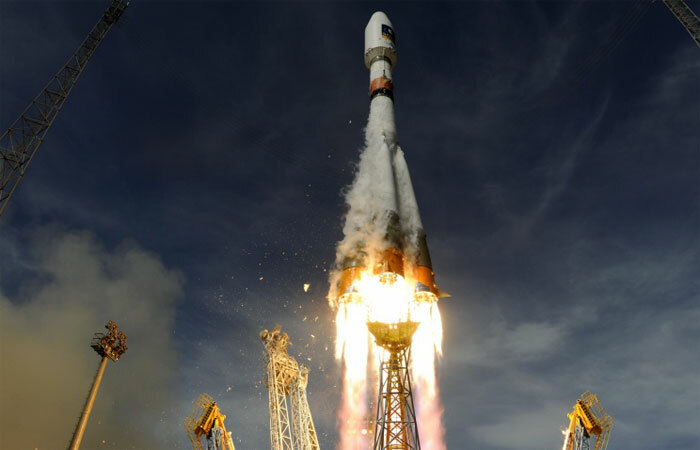 A Soyuz-U carrier rocket that took off at 00:53 Moscow Standard Time Tuesday /20:53 GMT Monday/ from the Baikonur Space Center in Kazakhstan has delivered into space the Progress M-21M cargo ship, which is expected to dock with the International Space Station three days later. A spokesman for Russia's Federal Space Agency /Roscosmos/ told Itar-Tass the launch was performed at launching pad No. 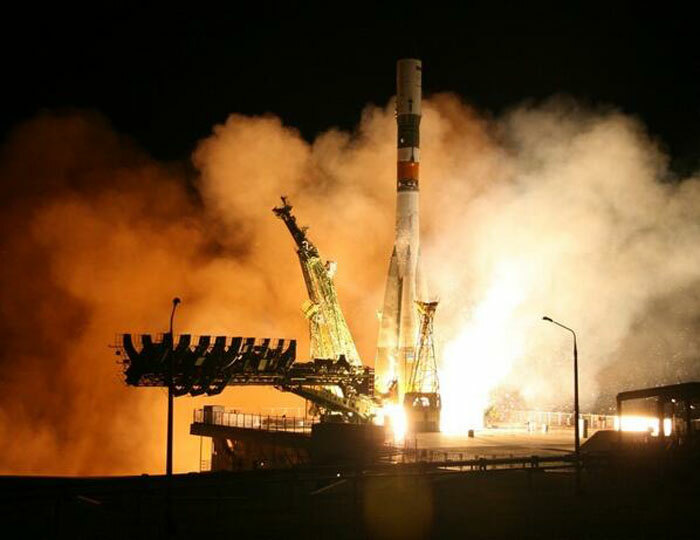 31 of the space center strictly on time, and the separation of the cargo ship from the carrier vehicle took place at 01:01 Moscow Standard Time. This time, a three-day approach pattern has been chosen for the Progress, in contrast to the shortened 6-hour pattern that was used as of October 2012. In the process of the docking maneuver that is due to take place November 30, flight testing of a new system of approach, Kurs-NA, will be done. The previous testing of the same system that was done in the summer of 2012 ended in a failure. Progress M-21M is carrying aboard more than 2.5 tons of various life support cargoes for the crew and for the technical maintenance of the station, including fuel, equipment, oxygen, water, clothes for the crewmembers, foodstuffs, equipment for experiements, medical aids, and spare parts. Apart from the standard food rations, the crew working at the ISS -- Russian cosmonauts Mikhail Tyurin, Sergei Ryazansky, and Oleg Kotov, NASA astronauts Michael Hopkins and Richard Mastracchio, and Japanese astronaut Koichi Wakata -- will get fresh vegetables and fruit, as well as candies and other sweets from psychologists and family members. While the Expedition 38 crew of the International Space Station tackled a variety of biological research and maintenance activities Wednesday, an unpiloted Russian cargo craft approached the complex for a “flyby” to test upgraded rendezvous equipment. The ISS Progress 53 resupply vehicle, which launched Monday from the Baikonur Cosmodrome in Kazakhstan, made its closest approach at 4:53 p.m. EST during a “flyby” to test upgraded Kurs automated rendezvous equipment. The Progress flew to within a mile of the complex, providing Russian flight controllers with valuable data on the revamped Kurs system that will be integrated into advanced Progress and piloted Soyuz vehicles in the future. During the “flyby,” Commander Oleg Kotov monitored the Kurs data from a laptop computer aboard the complex. After passing the station, the Progress will fly above and behind the outpost over the next 48 hours, setting it up for a final rendezvous and docking to the aft port of the Zvezda service module Friday at 5:28 p.m. NASA Television will provide live coverage of the docking beginning at 4:45 p.m.
A video camera aboard the International Space Station captured this view of the ISS Progress 53 cargo craft as it approached within a mile of the complex for a test of upgraded Kurs automated rendezvous system equipment. 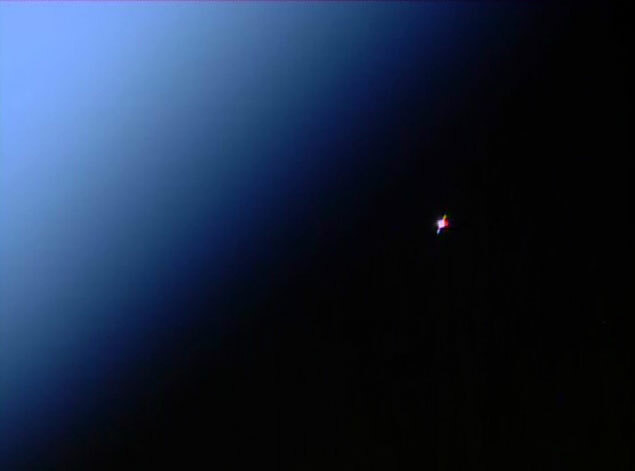 A camera on the ISS Progress 53 cargo craft captured this image of the International Space Station during Wednesday's "flyby." KOROLYOV, Moscow Region, - Russia’s cargo spacecraft Progress M-21M has docked with the international space station ISS with the use of the new automatic approach control system Kurs-NA. However, when Progress was just meters away from the station, the crew had to take over and complete the manoeuvre manually, Mission Control, near Moscow, told ITAR-TASS. “The approach was run automatically all the way, but when the cargo spacecraft and the ISS were just tens of meters away from each other, practically before the moment of contact, ISS commander Oleg Kotov took over,” a Mission Control spokesman said without explaining why the docking had to be completed manually. The system Kurs (Course) is the main instrument controlling the approach and docking the Soyuz and Progress spacecraft are equipped with. It has been in use since the 1990s. Its latest version, Kurs-NA is significantly smaller, consumes less energy and is far more accurate. International Space Station commander Oleg Kotov took over manual control of an approaching Progress supply ship Friday after an undisclosed problem and deftly guided the craft in for a smooth docking at the aft end of the Russian Zvezda command module to wrap up a four-day rendezvous.The Progress 53/M-21M spacecraft lifted off from the Baikonur Cosmodrome in Kazakhstan at 3:53:06 p.m. EST (GMT-5) on Nov. 25. Packed away on board were 1,763 pounds of fuel, 48 pounds of oxygen, 57 pounds of air, 925 pounds of water and another 3,119 pounds of spare parts, research equipment and holiday gifts for the station's six-member crew. Progress cargo ships typically take two days to reach the station, but this time around flight controllers built in extra time for tests of the spacecraft's upgraded KURS rendezvous system, replacing four navigation and positioning antennas with one. The M-21M spacecraft flew past the station Wednesday, passing within about a mile of the lab complex to give Russian engineers a chance to test the upgraded KURS system. 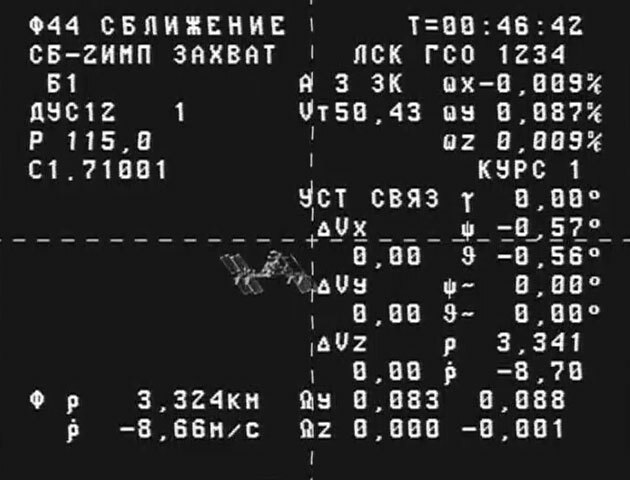 Kotov monitored data from the Progress on a laptop computer as it flew past the outpost and then dropped behind before moving back in for docking Friday. The final stages of the automated rendezvous appeared to go smoothly but at a distance of about 200 feet, the Progress apparently halted the approach and unexpectedly went into station-keeping mode. Flight controllers told Kotov to take over manual control with the TORU tele-robotic control system in the Zvezda module, using a computer display and a joystick to operate the approaching cargo ship.Russian cosmonauts are always on standby to take over manual control if the automated system has problems, but there was no immediate explanation as to what prompted the switch to manual control or whether it was related to the KURS upgrades. 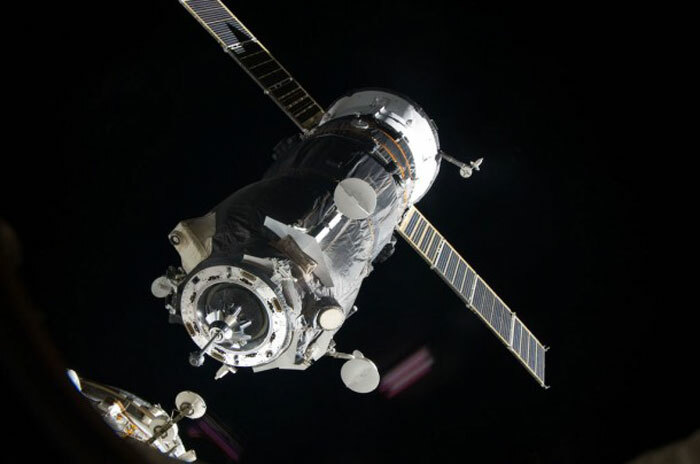 In any case, Kotov had no problems lining the Progress up and guiding it in for docking at 5:30 p.m. as the two spacecraft sailed over eastern Asia. A Russian space freighter docked to the aft port of the International Space Station’s Zvezda service module at 5:30 p.m. EST Friday, delivering almost three tons of food, fuel, supplies and holiday gifts for the Expedition 38 crew. The ISS Progress 53 cargo ship, which launched Monday from the Baikonur Cosmodrome in Kazakhstan, performed an automated approach to the station using upgraded Kurs automated rendezvous equipment. The on-orbit performance of the new Kurs hardware was tested earlier by Russian flight controllers during a “flyby” of the station Wednesday during which the Progress came to within one mile of the orbiting complex. The lighter, revamped Kurs system will be integrated into advanced Progress and piloted Soyuz vehicles in the future. When the Progress was about 60 meters from the docking port, it went into an unexpected station keeping mode. 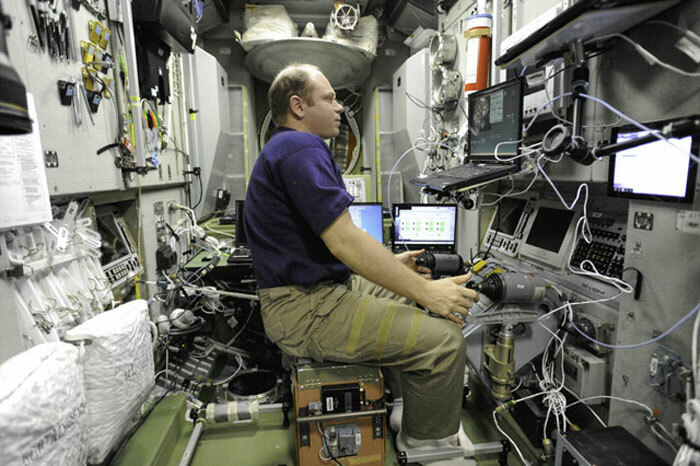 Station Commander Oleg Kotov took over manual control of the vehicle using TORU, the telerobotically operated docking system, and guided the vehicle in for a successful docking. At the time of docking, the station was flying about 260 miles over Kazakhstan. On Saturday, the crew will open the hatch to the Progress to begin unloading its cargo. Progress 53 is filled with 2.9 tons of food, fuel and supplies for the station crew, including 1,763 pounds of propellant, 48 pounds of oxygen, 57 pounds of air, 925 pounds of water and 3,119 pounds of spare parts, experiment hardware and holiday gifts. The Expedition 38 crew also supported a range of research activities and maintenance work aboard the orbiting complex Friday. Flight Engineer Rick Mastracchio began his workday with the Binary Colloidal Alloy Test science payload, which takes a look at colloids -- microscopic particles suspended in a liquid -- and may lead to improvements in manufacturing processes here on Earth. Mastracchio mixed some new test samples for the experiment and photographed the hardware. Commander Oleg Kotov practices manual docking techniques with TORU, the telerobotically operated rendezvous system, on Nov. 22. Kotov used TORU on Friday to manually dock the ISS Progress 53 resupply ship.